Minxy asked to bake some biscuits to enjoy after dinner and to pop in their lunch boxes for the week. After a browse through our collection of books and sheets she food a yummy recipe with pretty pink icing that were crisp on the outside yet crumbly in the centre. Delicious! Combine the butter, icing sugar, egg yolk and vanilla extract in a bowl until creamy in texture. 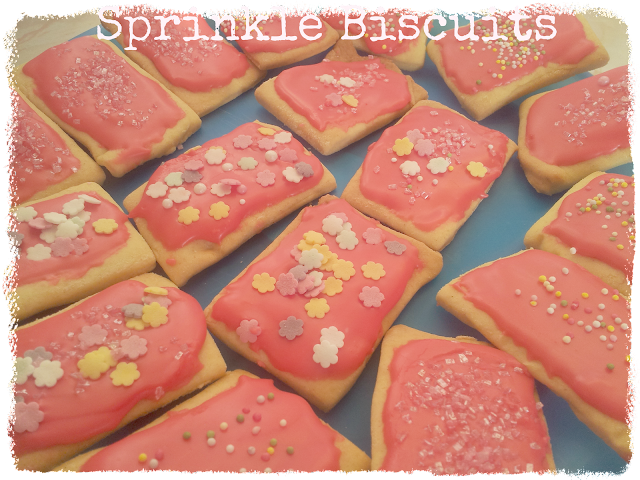 Ohh they do look delicious and so pretty too :-) Thanks for sharing at Happy Family Times! They look delicious!! Thank you for sharing at Happy Family Times! Only five ingredients + sprinkles- simple! These look so cute, thank you! I have a kid's party to prepare for next week. Might make some of these! These look lovely and so pretty too!